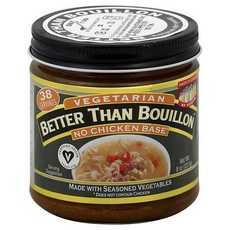 Enjoy Better Than Bouillon No Chicken Base. 38 Servings. Makes 9.5 Quarts Of Broth. Certified Vegan. Does Not Contain Chicken. Only 1 Tsp Better Than Bouillon = One Cube Or 8 Oz. Can Of Broth. Made With Seasoned Vegetables. Does Not Contain Chicken. (Note: Description is informational only. Please refer to ingredients label on product prior to use and address any health questions to your Health Professional prior to use.